Are you hardest on yourself? I know I am. I realized recently I have a problem treating myself nicely and so I’ve been researching ways to treat myself with more self-compassion. I came across a book I’d recommend to anyone struggling with the same issue, “Self-Compassion: The Proven Power of Being Kind to Yourself” by Kristen Neff, Ph.D. This book has given me so much insight into why I, like so many others, struggle with treating myself nicely. Our lack of self-compassion is so often tied to a desire for control: we were taught as children that we should be able to control ourselves and when something happens that shakes that belief, we feel impossibly flawed and unworthy. It doesn’t matter whether it’s a random spot of bad luck that we feel we should have been able to anticipate and avoid or a time when our self-control slipped and we went ahead and ate the cookie; when we lost our perception of being in control, we feel as if we’ve failed. When we judge and attack ourselves, we are taking the role of both the criticizer and the criticized. By taking the perspective of the one holding the whip as well as the one quivering on the ground, we are able to indulge in feelings of righteous indignation toward our own inadequacies. And righteous indignation feels pretty good. So, if I’ve made myself feel bad by letting myself down all I need to do it give myself a good talking to and strongly express my disappointment. Now, I feel a little bit better because I’ve gotten my anger at the situation off my chest. But that means that I soothed my uncomfortable emotions (albeit in an unhealthy manner) instead of taking a good look at why I feel bad and making any necessary changes. Nothing changes and I’m just setting myself up for another round of harsh self-talk. A key skill, then, is learning to be comfortable with uncomfortable emotions. 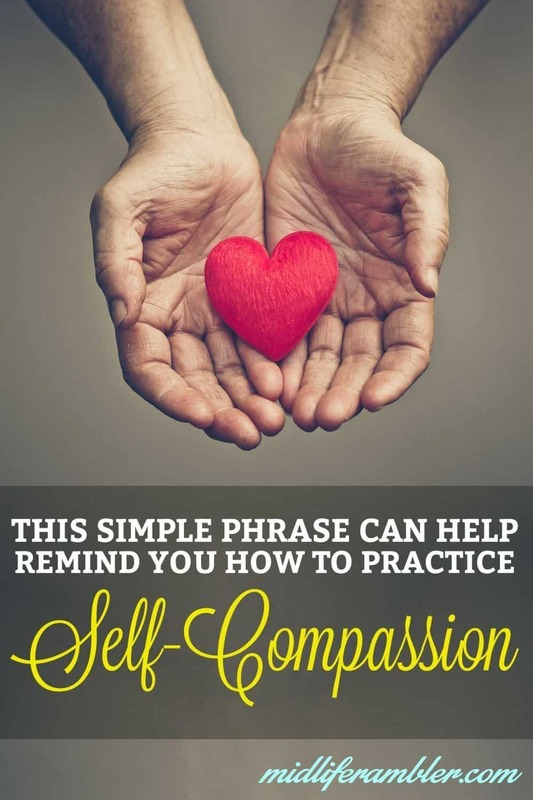 When a situation arises (either externally, such as a moment where we feel foolish or wronged, or internally, when we start to ruminate on all the ways we’ve failed in the past and all the ways we might fail in the future), we need some way to remind ourselves to take a breath and remember to practice self-compassion. This is a moment of suffering. This sentence helps you stop and recognize you’re in pain. It keeps you in the moment rather than blindly trying to fix your discomfort without even acknowledging it. Suffering is part of life. You’re not alone in this; everyone suffers. This is part of being a human. May I be kind to myself in the moment. This is your reminder of how you want to respond to your discomfort. May I give myself the compassion that I need. Remember that you, like everyone, deserves and needs compassion. How can you lovingly support yourself through this time? I made a simple graphic to help us all learn and remember to use this mantra. But I’d recommend taking it a step further and actually writing it down as many times as you need to in order to burn it into your brain. There is some research to suggest that when you write something down, your brain subconsciously begins to practice that new skill. By writing this mantra repeatedly, you can memorize it for later use and start to use it immediately. Win-win! This is fantastic! I will be sharing this. Hope your kick boxing class went well. What an awesome opportunity to have a class to attend. I live in the middle of nowhere.